2.5 x 2.5 x 2.2 in. Almost every dedicated camera on the market shares one thing in common: It is -- in some form or other -- a box housing a lens. 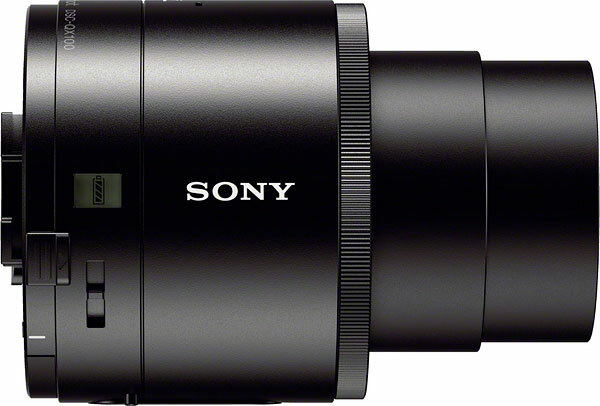 The long-rumored, large-sensor Sony QX100 "lens-style camera" and its sibling the long-zoom QX10 don't just buck that trend, they toss it into orbit. The box is gone, leaving only the lens barrel behind. The result is a design radically different to anything that has gone before -- a premium lens paired wirelessly with your smartphone -- and one that aims to change the way you think about photography. The concept for the QX-series lens-style cameras is simple and rather clever. In much of the developed world, smartphone adoption rates have already passed 50% of cellphone owners. By 2017, half of all cellphones worldwide are expected to be smartphones. Meanwhile, point-and-shoot cameras are a dying breed, their larger sensors and zoom lenses happily ditched by smartphone owners in the quest for lighter pockets. Those which remain are fast becoming mere peripherals for the smartphone, which with large touchscreen and better connectivity makes a much better device from which to view and share your images. But if you're already carrying a connected device with a great display, reasoned Sony's product designers, why does your camera even need the bulk, weight, and expense of a screen at all? Back to basics. If you ditch the LCD and pare the camera down to its very basics, you can do away with the boxy camera body altogether. That's precisely what Sony has done with the Cyber-shot QX100, a camera that shares much -- including the same 1-inch-type, 20-megapixel, backside-illuminated image sensor and Carl Zeiss Vario-Sonnar T*-branded 3.6x optical zoom lens -- with the existing Sony RX100 II point-and-shoot. And not only is it a larger sensor than exists in most point-n-shoot cameras and all smartphones -- it also sits behind a lens with a bright f/1.8 maximum aperture at the 28mm-equivalent wide angle. (By the 100mm-equivalent telephoto, it falls to f/4.9.) 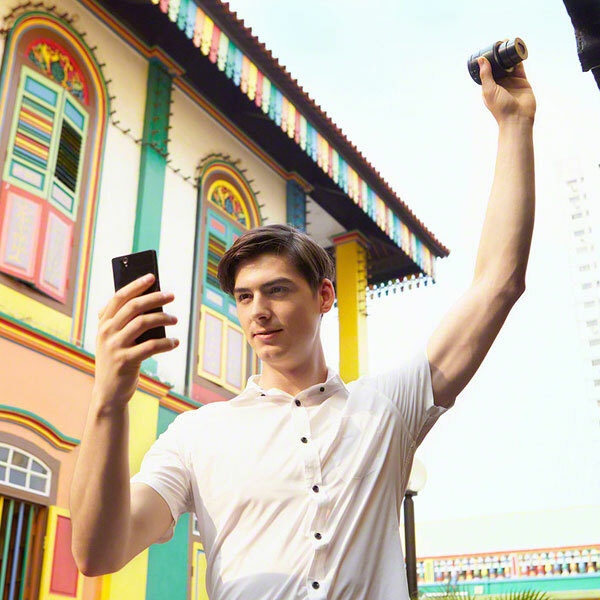 The lens also sports SteadyShot optical image stabilization, including Sony's Active mode which better stabilizes video, even shot when walking. It's an impressive pairing: Although we've yet to complete our review of a production-level RX100 II, our early impression is that it yields excellent results in that camera, and there's no reason that the QX100 shouldn't be capable of the same. Making it happen. Your Android or iOS smartphone provides everything needed to make the QX100 a reality, and as a result the camera itself can be made smaller, lighter, and less expensively. (Or at least, that's the theory.) And yet, the lens-style camera can still offer what your smartphone by itself can't: A larger sensor and a decent zoom lens. It's also more versatile, letting you position camera and display separately where they're needed. How much difference is there? But how much of a savings can you make by stripping the camera down to its basics? A comparison of the Sony QX100 lens-style camera to its nearest equivalent in the company's existing camera line is illuminating. The fairest comparison is to the original Sony RX100, which has the same lens and sensor size, but lacks the LCD articulation mechanism of the RX100 II. The difference in volume is actually surprisingly modest. 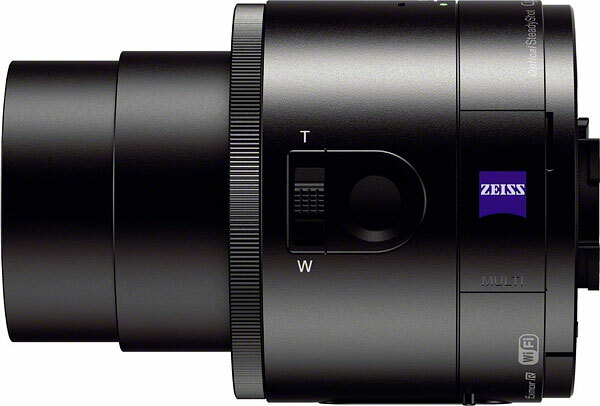 Although the new Sony QX100 lens-style camera is more than a third narrower, it's half as deep again as the RX100. The net result is that there's very little difference in terms of size, and with its thicker body, the QX100 is actually a bit less pocket-friendly. However, the lens-style camera is a quarter lighter than the traditional camera, loaded and ready to shoot. The Sony QX100 also has a list price (US$500) almost a quarter below that of the RX100, and a third below the RX100 II. Are there drawbacks? Obviously, by removing the display, you're made pretty reliant on your smartphone, if you want to see what you're shooting. (Although interestingly, the QX100 will work standalone, too.) And of course, the design will come with some ergonomic limitations, which will vary depending on the size of your smartphone. You can't really expect the cobbled-together pairing of a lens barrel with a device that was never intended to bear one to provide the same ergonomics as a dedicated camera, after all. Don't shoot in the dark. There's also no flash strobe or autofocus assist illuminator, and while that will to some extent be offset by the size of the image sensor (and its light-gathering capabilities), there's only so much you can do in low light without a strobe. Depending upon your phone, you may be able to leave it in "flashlight" mode, but smartphones typically have rather weak flash output anyway. Not for enthusiasts. You're also limited to Automatic or semi-automatic exposure control. There's no manual exposure control, and nor is it even possible to shoot in Shutter-priority mode. Your choices are Aperture-priority, or one of several different Auto modes. Nor can you adjust sensitivity, and the range of sensitivities available even under automatic control is narrower than that for the RX100 II. And bizarrely, white balance control is limited to auto, a selection of presets, and a direct Kelvin color temperature selection -- but there's no way to measure white balance from your scene directly. A lesser concern, although it's certainly still a shame, is that you can't shoot in RAW mode with the QX100, even when storing images on the camera's own card slot. But then, you'd hardly expect raw files from a camera that won't even let you set exposure manually. Photographic control. Enough of what you can't do -- what can you control? Well, obviously there's the optical zoom lens, and you can touch your smartphone's LCD to set focus as well. (Alternatively, you can let the camera select the focus point, or focus manually.) And as we've mentioned, you can adjust the lens aperture and white balance. Finally, you can adjust exposure compensation, within a +/-3EV range, in 1/3EV steps. That's a pretty limited selection compared to the enthusiast-friendly RX-series cameras, though. In fact, it's limited compared to a lot of cameras, at its price point. Exposure. It's worth noting that, although it clearly doesn't cater to experienced photographers, the Sony QX100 camera does beat the built-in camera of the typical smartphone hands down, when it comes to exposure variables. In Intelligent Auto mode, sensitivity ranges from 160 to 6400 equivalents. In Superior Auto mode, thanks to in-camera stacking of multiple exposures, the upper limit climbs to ISO 25,600 equivalent. For Program, Aperture-priority, or Movie shooting, the upper limit falls to ISO 3200. Shutter speeds -- always controlled automatically, remember -- range from 4 to 1/2000 second in iAuto mode, 1 to 1/2000 in Program Auto, and 8 to 1/2000 in Aperture-priority. Incidentally, Sony notes that its Superior Auto mode will recognize 44 scene types, while Intelligent Auto can differentiate between 33 scene types. Performance. Perhaps not surprisingly, given that everything it does must be transferred via a standard Wi-Fi connection, the Sony QX100 is rather limited in terms of performance compared to the RX-series cameras. Those models are capable of shooting at up to 10 frames per second with focus and exposure locked, or 2.5 fps without. 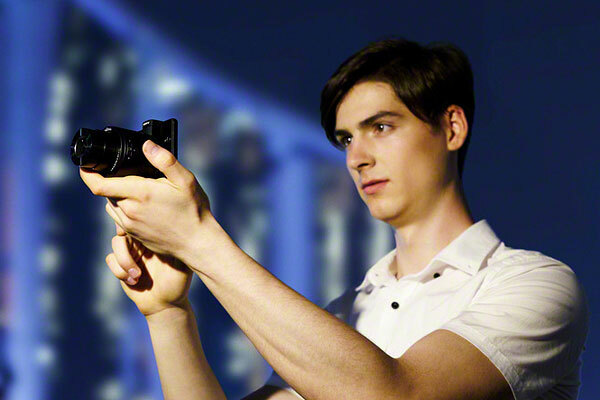 The QX100, though, is limited to a manufacturer-specific one frame per second. The Sony QX100 can be mounted on third-party cameras using this adjustable mount adapter. Sony also rates startup time at a lackadaisical 6.9 seconds, a full 2.5 times longer than needed by the RX100. And the company predicts a shooting lag of 0.21 seconds, although we can't compare this to our in-house figures, since we don't know the test conditions. Shutter lag, though, is rated at 0.035 seconds, which is 2.7 times the figure we measured for the RX100. Video. 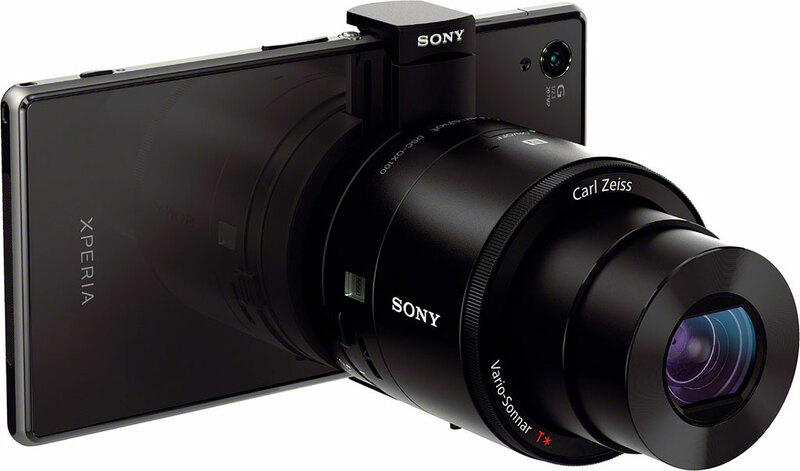 Here, too, the Sony QX100 is limited, compared to the traditional camera with which it shares its DNA. The Sony RX100 II allows Full HD (1920 x 1080 pixel) capture at rates of 60i, 60p, or a film-like 24p, and allows you to control exposure manually. 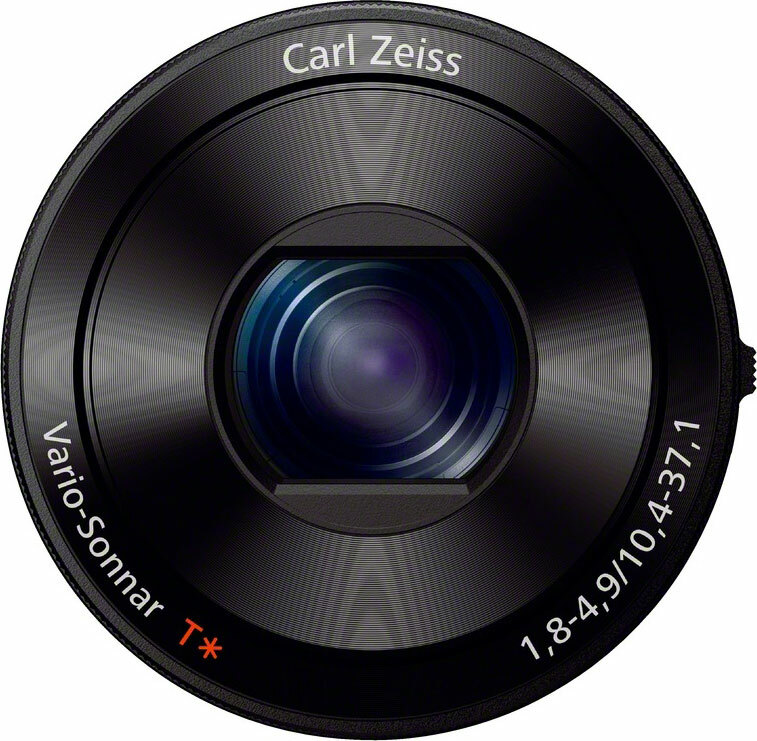 The lens-like QX100, meanwhile, is limited to Anamorphic HD (1440 x 1080 pixel) capture, with a fixed 30p frame rate and automatic exposure control. It also has a stricter clip length limit of 25 minutes, where the RX100 II is capable of 29 minute clips given sufficient storage space. On the plus side, it does include a stereo microphone, as did the RX-series cameras. Added versatility. As we already mentioned, a less obvious advantage of the Sony QX100 is the extra versatility in framing that it allows. You can separate camera and display, and since the connection between the two is via Wi-Fi, the range is reasonably generous. Want to get a photo of an easily-spooked animal? Set up your camera on a tripod -- there's a mount on its base -- and then move back 10 or 15 feet. (Perhaps even 20 feet, under ideal conditions.) 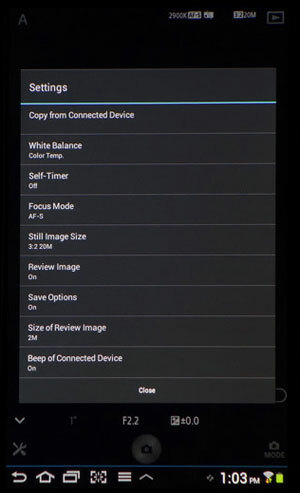 You still get a live view feed on the smartphone's display, and have complete control over the camera. You won't be spending all your time shooting on a tripod, though, and holding smartphone and camera in each hand wouldn't make for a very satisfying experience. For that reason, Sony provides a small, folding accessory which lets you attach camera and smartphone to create a single unit. Obviously, Sony would love for you to use one of its own phones, but there's a good chance you've already got one you're happy with. For that reason, the accessory will adjust mechanically to accommodate a range of different phone sizes. A tiny monochrome LCD on the side indicates charge level. A battery at the rear of the QX100's barrel provides power for the sensor, processor, lens, and radios. A built-in storage slot accepts MicroSD and Memory Stick Micro cards. Literally everything is there to shoot without your phone if it runs out of power, or you just don't want to take it out of your pocket. But of course, if you choose to do so, you'll be shooting blind without a display, and with no way to adjust camera setup, given there's no screen to interact through. Why not pare down more? The ability to use the QX100 standalone probably goes some way to explaining why the size advantage isn't more significant: Other than the display, it still includes everything else you'd find in your traditional camera. By decoupling your smartphone "viewfinder" from the camera itself, shooting from awkward angles becomes much easier. Had Sony wanted to, it could have pared off some of these features for a smaller device. The result would probably have been compromised, though, since you'd have been more reliant on your phone's battery and available storage -- often pretty limited -- and you'd likely have had to rely on its touch screen for all control, even the shutter button and lens zoom. Ease of use. Since you're reliant on your smartphone for almost any functionality -- taking or reviewing images and movies, or even just changing camera settings -- it's pretty crucial that you can pair it quickly and easily. To help with that process, Sony has included Near Field Communications technology in the Cyber-shot QX100. If your smartphone is compatible with NFC, that means you just have to enable its radio (or leave it enabled; the low range makes it fairly secure, and it typically has relatively modest power consumption), then hold the phone next to the NFC logo on the camera briefly. It will pair automatically, and establish the higher-speed, longer-range Wi-Fi connection required to provide for a live view video feed and remote control capability. There's just one catch: Apple is so far continuing to resist adopting NFC in its products, and Sony only provides its free PlayMemories Mobile remote control app for iOS and Android devices. That means that you can't use a Windows Phone, Symbian, or Blackberry smartphone with the QX100, and nor can you use the NFC pairing with an Apple device. Hence NFC pairing is available to Android users only. iOS users will have to pair the old-fashioned way. Users of other mobile operating systems need not apply at all -- the QX100 will work only for Android and iOS. 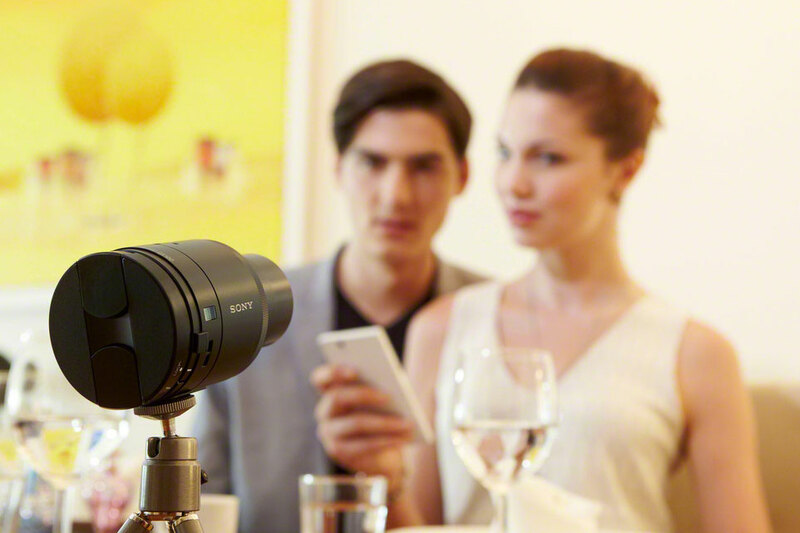 The Sony QX100 lens-style camera has a tripod mount at its base. Connectivity, storage, and power. 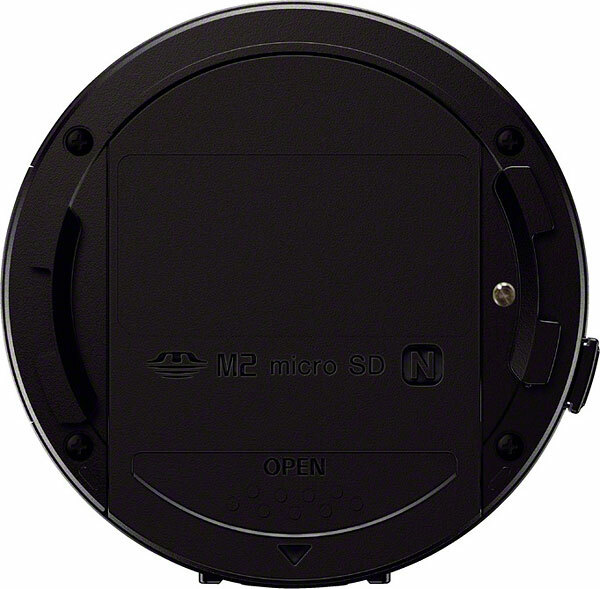 We mentioned previously that the Sony QX100 includes a microSD / Memory Stick Micro slot. This is compatible with microSDHC and microSDXC cards too, as well as Memory Stick Micro Mark 2 cards. The QX100 also transfers images to your phone's storage as they're shot, so you can share them immediately or just keep them as a backup, until you run out of space. Connectivity options include the aforementioned Wi-Fi and NFC radios, as well as a single Micro USB port, which provides for USB 2.0 High Speed data connectivity, and in-camera battery charging. Power comes from an NP-BN12 lithium-ion rechargeable battery pack, and is rated for just 220 frames on a charge, despite the fact that there's no flash strobe. (By contrast, the RX100 II captures 350 frames on a charge, with 50% flash usage.) Alternatively, Sony predicts 110 minutes of battery life in Record mode, down from 175 minutes in the RX100 II, even though there's no large LCD backlight to sap power. And in movie mode, Sony expects 55 minutes of capture to be possible, down from 80 minutes in the RX100 II. Price and availability. The Sony Cyber-shot QX100 lens-style camera ships from September 2013 in the US market. Pricing is set at US$500, including a battery, wrist strap, smartphone attachment and micro USB cable. Accessories. Sony also has plans to offer a variety of accessories for the QX100 camera, including dedicated smartphone attachments for specific Sony phones like the Xperia Z, as well as a soft carry case that will protect the camera from minor knocks and scuffs. The following includes information on both the QX10 and QX100 since so much of their operation and user interface is the same. I'll call attention to differences where appropriate. 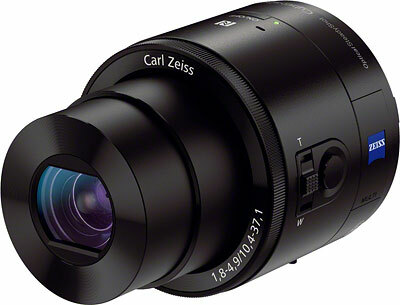 There's no question that the Sony "lens-style" cameras are an interesting innovation (I love the concept! ), but how are they to use in actual practice? Interface, controls and design. At first contact, the user interface displayed on the smart device for either of these cameras is pretty functional. You can zoom the lens, adjust exposure, touch the screen to set an AF point and focus, etc. I found using the shutter button displayed on the smart device's screen a little awkward, but both cameras also have a shutter button on the side, which makes for steadier shooting. Zooming the lens with the on-screen controls is also slightly awkward, and zoom speed in that mode is a little leisurely. Again, I found using the dedicated toggle on the side of the barrel more convenient, and the zoom action was a good bit more responsive with it as well. You can either attach the camera to the front of your phone, using two gripper-tabs that fold out from the device's back cap, or you can hold it separately, and it'll stay connected up to a distance of 10 feet or so; handy for holding the camera over your head or down low, or selfies with a reasonable distance between you and the camera: Set the camera on a table, bookshelf or other object (or give it to the waiter to hold for you), and you can zoom to frame better, adjust exposure, and then snap the shot, all from your phone. My big disconnect with these cameras came when I tried to control them as cameras. I guess I'd expect the more digicam-oriented QX10 to have a rather dumbed-down interface, and it does. Exposure-mode choices are restricted to Intelligent Auto, Superior Auto and Programmed Auto. Period. In Programmed Auto mode, you get to control white balance and exposure compensation and not much else. Superior Auto does at least make available Sony's multi-exposure low-light modes (Handheld Twilight and Anti-Motion Blur), but only under automatic control. Overall, that's really limited, but if the intended market is people who barely know how to push the shutter button on their cell phones, maybe simplicity is a good thing. (On the other hand, I've always said that the thing to do with camera user interfaces is to go ahead and put all the advanced-user options in there, just hide them in an "advanced" mode if you're concerned about confusing the tyros. Why penalize the experienced users, just for the sake of not confusing beginners?) Also, neither model has a built-in flash. Whatever the case, Sony chose to go with an extremely simple user interface for the QX10, but I could see it still being attractive to its intended audience. QX100 vs. RX100. OK, that's the QX10, you might expect something really simple like that. The camera I was really interested in the QX100. 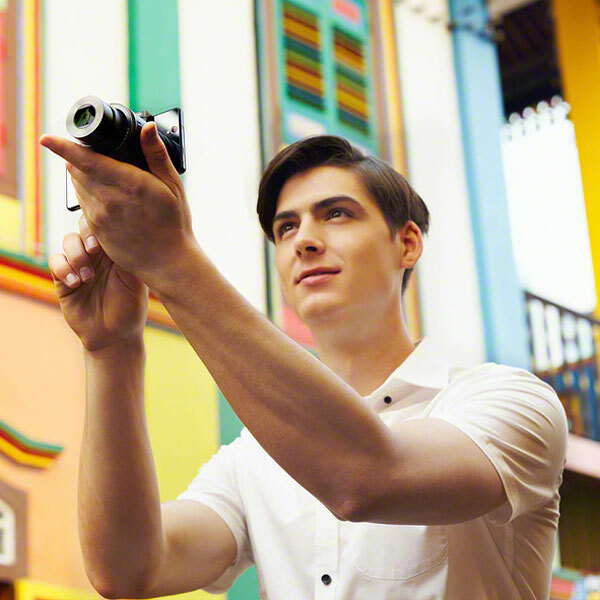 Just think, an even more compact RX100 in your pocket; take it with you anywhere! Shooting operation and performance. But that's just the size, what about picture-taking? Unfortunately, that was my second and arguably bigger disappointment. I approached the QX100 expecting the full RX100 experience. I mean, it's all just user-interface, right? And now you've got a big, beautiful touch screen on the smart device to spread it around on. Great news, right? Not quite. The controls for the QX100 were only a smidgen more sophisticated than those for the QX10. Seriously? Unfortunately, yes. You do have a bit more control with the QX100, but it's precious little. With the QX100, you have the same Intelligent Auto, Superior Auto, and Program Auto as the QX10, but also Aperture-priority exposure control, which is at least something. No shutter-priority, no Manual mode, and once again no ISO control. You do have white balance control as with the QX10, and this time it includes a Kelvin setting with a range from 2,500K to 9,900K, but no Manual/Custom option. And there's no RAW support either. Once again, while Sony's special multi-exposure modes are available via the Superior Auto exposure option, you don't have the option of choosing them yourself, and Sony's excellent Sweep Panorama feature isn't offered either. In fairness, Superior Auto does a pretty decent job of deciding when to use the multi-exposure settings, but the RX100 is clearly an enthusiast camera, and people expecting a similar experience from the QX100 will be disappointed. Let's talk about the actual process of shooting with either of these cameras, though; the news there isn't all bad. They can in fact take much better photos than the typical cell phone camera, and in the case of the QX100, dramatically so, especially in low light. The Sony PlayMemories app gives you some control over how data is transferred between the lens/camera and the smart device, and your choice there impacts performance significantly. After snapping each photo, you can choose to transfer either a 2-megapixel downsampled file, or the full-resolution one to the smart device. If you choose to immediately transfer the full-res original, there'll be quite a delay between snapping the photo and seeing the result on-screen. Transfer between the lens/camera and the smart device is via WiFi, so the lag between shooting and seeing the "review" image is longer than you'll have been accustomed to with a conventional camera. If you choose to always transfer the full-res file, the delay will interfere with your ability to snap multiple images in succession. Transferring the 2-megapixel downsamled image is considerably quicker, but still a matter of several seconds (I timed it at roughly 4 seconds with a prototype sample). In practice, the 2-megapixel sub-sampled images will be more than enough for posting to Facebook, Twitter, etc., so the full-res images can happily live on the lens/camera's microSD card until you offload them to your computer. 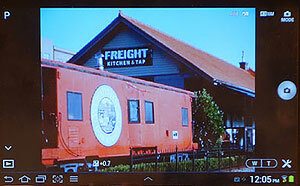 (Or transfer to your smart device at your leisure.) Also, while the time from shot to preview is rather long, there's also no continuous-shooting mode with either model. Overall, this slow response is a much different experience than you'd have with even a modest digicam. Then there's battery life. The QX100 and QX10 are both CIPA-rated for 220 shots between charges, which is very short compared to the RX100 and other compact cameras. While the QX models have to power an LCD display's backlight, they do have to keep a WiFi connection live, which evidently consumes a modest amount of power. Compounding this is that the batteries in the QX models are the svelte Sony NP-BN type, packing a total charge of 2.3 watt-hours. 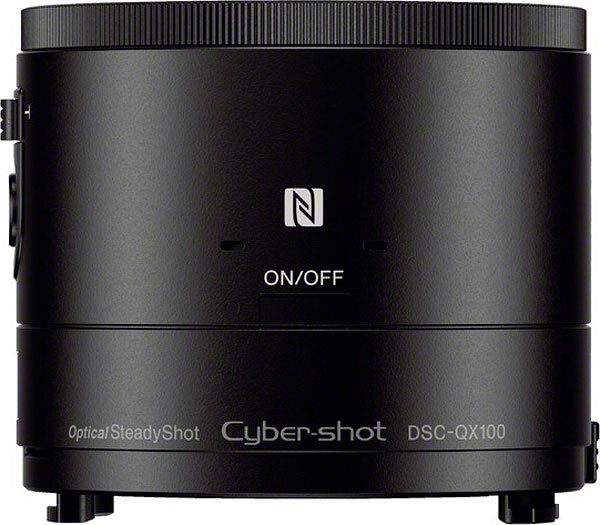 Compare this to the RX100's NP-BX1, with 4.5 watt-hours of power. The difference became apparent in playing with both QX samples; they chew through batteries pretty quickly. Fortunately, the battery is interchangeable, so it won't be difficult to pack along a spare or two. First impressions. I think that these devices are the first of many such that we'll see, and as the pioneer products in this space, they have a few entirely-to-be-expected rough edges. Despite the QX10's lack of camera controls, it is in fact extremely compact, slipping very easily into even the smallest pockets. That, combined with its relatively low selling price should result in a fair number of sales for it. The opportunity to get not only better image quality, but a 10x zoom, all well-integrated with your cell phone or smart device should be a compelling value proposition for a lot of people. The QX100 is a little hard to see, though. I came into this evaluation really stoked on the concept, and really, really wanting to like the QX100. If it really was a more compact RX100 that integrated tightly with my cell phone, I'd have been tempted to buy one for myself. Unfortunately, most of the reasons I'd by an RX100 for don't apply or aren't available with the QX100. The market for the QX100 is clearly enthusiasts rather than casual happy snappers -- but it doesn't really offer what that sort of user is looking for. All this said, one possible saving grace here is that the UI is just software and firmware. I don't see any reason why most of the functions of a basic digicam (in the case of the QX10) or the RX100 itself (in the case of the QX100) couldn't be implemented over time, through firmware updates to the lens-cameras and to the PlayMemories Mobile app itself. Sony has shown a good track record in recent years of offering meaningful firmware updates to some of their products (the NEX line comes particularly to mind), so I think it's possible that we'll see some evolution of the QX series through firmware/software updates going forward. At the end of the day, I think that the QX lens-style Cameras are a seminal yet significant step in the merging of camera and smart device functionality, a concept and general form factor that I expect others may mimic over time. I can see a place for the QX10, and might even buy one for my own use, to get beyond the limitations of my phone's built-in camera. For the QX100, I think Sony needs to work on the firmware/software, to add more of the features people would by an RX100 for. That's the real promise of the QX100, and if they can deliver on it, I think Sony could sell a fair number of them.